Jubilee Hall Trust (JHT) has continued to expand its work in Camden to help build a healthier community. After delivering a successful summer programme at two local schools, the Trust has now developed the partnership at both Argyle and Torriano Primaries. At Argyle, we have confirmed a new after school dance club (to start in February) that will lead into the Big Dance celebration in 2016, and discussions are underway about supporting a “Mile a Day” and/or a “Kids Marathon” programme to start after Christmas. At Torriano, we continue to support the after school dance club, as well as a weekly fitness class for parents and staff. We helped the school to implement a new protocol for children to be able to utilise the Active Space playgrounds after school, and staffed a very successful (fully booked out!) after school Energy Club as a continuation of the summer programme. 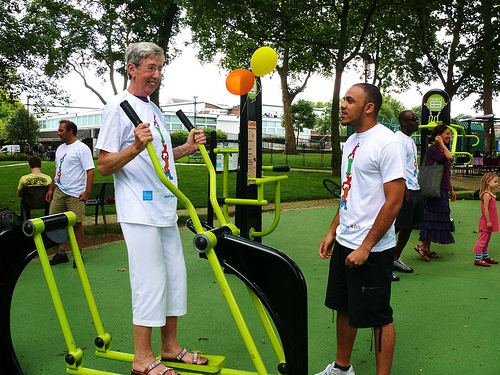 JHT is also supporting the new Camden Active All Areas initiative to get inactive residents in deprived areas more active with community-based projects. We will be providing free studio space at our Armoury gym for a weekly women’s fitness class and a 50+ Vitality class and are also helping to fund supervised free fitness sessions at the Lismore Circus outdoor gym.